Jonty Harrison (born 1952) studied with Bernard Rands at the University of York, graduating with a DPhil in Composition in 1980. Between 1976 and 1980 he lived in London, working at the National Theatre (where he produced the tape components for many productions, including Tamburlaine the Great, Julius Caesar, Brand and Amadeus) and City University. 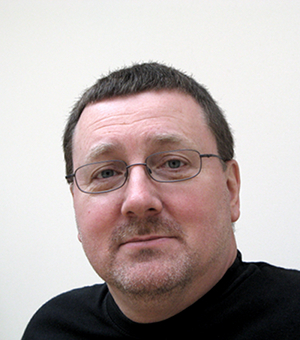 In 1980 he joined the Music Department of The University of Birmingham, where he is now Senior Lecturer, as well as Director of BEAST (Birmingham ElectroAcoustic Sound Theatre) and the Electroacoustic Music Studios; for ten years he was Artistic Director of the Department's annual Barber Festival of Contemporary Music. He has been a Board member of Sonic Arts Network for many years (Chair 1993-96), his main responsibility being liaison with agencies in various parts of the UK in an attempt to establish a National Studio. He plays an active role in the musical life of Britain, serving on a number of committees, as well as making conducting appearances with the Birmingham Contemporary Music Group (most notably conducting Stockhausen's Momente in Birmingham, Huddersfield and London) and the University New Music Ensemble. He has been a member of the Music Advisory Panel of the Arts Council of Great Britain and of the Council of the Society for the Promotion of New Music. As a composer he has received several Prizes and Mentions in the Bourges International Electroacoustic Music Awards (including, in 1992, a Euphonie d'Or for Klang, cited as one of the "significant works" of the Bourges competition's history), Distinction and Mention in the Prix Ars Electronica in Linz, Austria, First Prize in the Musica Nova competition, Prague, the Lloyds Bank National Composers' Award, the PRS Prize for Electroacoustic Composition, an Arts Council Composition Bursary and a Leverhulme Research Grant. Commissions have come from many leading performers and studios, including the Groupe de Recherches Musicales, Paris, the Groupe de Musique Expérimentale de Bourges, the International Computer Music Association, MAFILM/Magyar Rádió, Budapest, IRCAM/Ensemble InterContemporain, Paris, the BBC, the Birmingham Contemporary Music Group, the Fine Arts Brass Ensemble, the Nash Ensemble, Singcircle, John Harle, Beverly Davison, Harry Sparnaay and Jos Zwaanenburg. His music is performed and broadcast worldwide, and several works are available on CD: Pair/Impair, ...et ainsi de suite..., Unsound Objects, Aria and Hot Air on Articles indéfinis, a Jonty Harrison "solo" CD on the empreintes DIGITALes label (Montreal); Klang and EQ on NMC (London). Upcoming releases include Sons transmutants/sans transmutant and Ottone on Merlin and Unsound Objects as part of the CDCM collection on Centaur.